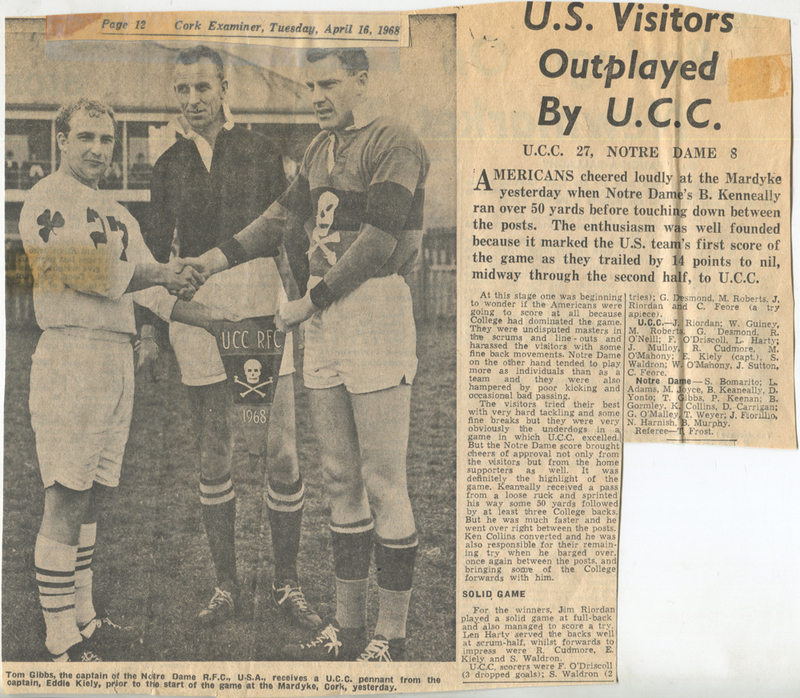 Fifty years ago as of April 2018, the University of Notre Dame rugby club became the first team to represent the university in competition in Ireland. Tom Condon, then a senior on the squad, recalls the momentous five-game tour. Late in the morning of April 14, 1968, 15 young men representing the University of Notre Dame jogged onto the rugby pitch in Limerick City. The whistle, the kickoff, and it finally happened: the Fighting Irish had come to Ireland. That morning 50 years ago – Easter Sunday, appropriately enough – marked the first time the American university most associated with Ireland sent an athletic team to play there. As the match against the Limerick Rovers got going, we the visitors urged ourselves on, yelling, “Let’s go Irish,” “C’mon Irish.” This caused the Limerick lads to laugh their heads off. “It sounds like you’re bloody rootin’ for us,” one said. In a way, we were. Most of us were Irish-American – Collins, Kenealy, Carrigan, Murphy, Gibbs, O’Malley, Keenan, Brennan, Joyce, Hennessy, etc. – separated from the Limerick boys by accident of family history. A college sports team going to Europe today would barely raise an eyebrow; it happens all the time. Not so in 1968. It was still a big deal to go to Europe. Notre Dame then had, I believe, two study abroad programs, in Innsbruck, Austria, and Angers, France. Now it has them in dozens of places, including three in Ireland, and more than half the student body studies overseas. But back then our trip garnered coverage in many Midwest newspapers, including all of Chicago’s. 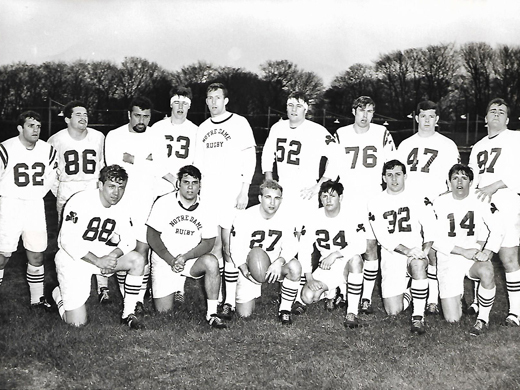 To send a team to Ireland in the 1960s meant finding a sport played in both countries (this being years before it occurred to anyone to fly the Notre Dame and Navy football teams to Ireland). Baseball and hurling were out; rugby would work. 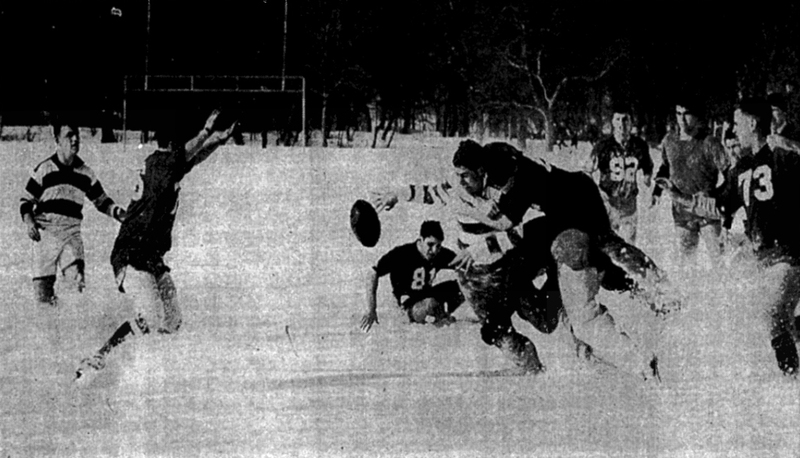 A student named Bob Mier started rugby at Notre Dame in 1961, and it became an official club sport two years later. The team quickly became a power in the Midwest, compiling a 109-16-3 record over the next five years. In club sports then, the players had to do all the work – the scheduling, travel, fundraising; it wasn’t handled by someone from the athletic department. This was good preparation for life. And so we put the arm on Notre Dame alumni clubs in Indianapolis and Chicago – as well as parents and friends – and held fundraising parties. In April we set off for Shannon. We managed an 8-0 win in the Limerick match. Afterward, one of the local players asked, “Why do they call you the Fighting Irish? Aren’t the Irish well thought of in America?” I’ll get to that. We then headed south to play University College Cork, one of the best teams in the country. The bad news is that we were losing 14-0 when he scored. A drawback of club sports, at least ours, was that we didn’t have a coach. We had a faculty advisor, a British-born architecture professor named Ken Featherstone, but not a day-to-day coach. We taught the game to ourselves and played a punishing but rudimentary version of it. The UCC side played a hard but sophisticated game, with tactical kicking and running plays we had never seen. If that weren’t enough, their fly half, one F. O’Driscoll, according to the Cork Examiner, could dropkick from seemingly anywhere on the field. A dropkick is worth three points in rugby, as it is in American football. It’s almost never done in U.S. football, though, because the pointed ball rarely produces a true bounce. The rounder rugby ball does, in the hands of a skilled practitioner. In my four years on the team we’d made exactly two drop goals. O’Driscoll banged three through the uprights in the first half. Decades later, my son spent his junior year of college at UCC and my wife and I visited, as parents of kids studying in Ireland are wont to do. I walked down to the field and quietly paid homage to Mr. O’Driscoll. Ireland was just opening up to tourism in the 1960s, and there was a sense of excitement in Cork. The craic in the pub that night was more than delightful. A fellow asked me if I read any contemporary Irish writers or poets. As it happened, I had just been introduced to the poetry of Thomas Kinsella and dropped the name. Well, lord, everyone in the pub knew Kinsella’s work, and two people knew him personally. After Cork, our next stop was against the Thurles rugby team, in County Tipperary, but I hopped off the bus for a brief detour in Mitchelstown, County Cork, ancestral home of the Condons. My great-grandfather had came over and fought for the Union in the Civil War. We still had a relative who sent us Irish Sweeps tickets every year into my childhood in the 1950s. I went into one of the stores with the Condon name, the pharmacy as I remember, and introduced myself. Well, they closed the store, invited the neighbors, brought out the Guinness, and we had a lovely visit. A pretty, dark-haired young lady who was a dead ringer for my sister Pat walked in. The resemblance was so close I almost asked when she got in. The New York sports columnist Jimmy Cannon once said he didn’t like Boston because everyone looked like him. I liked Mitchelstown for that reason. The hospitality everywhere was exquisite. Each team had us over for socials, dinner, singing, and even, in Thurles, golf, courtesy of international Irish rugby star Noel Murphy. We won the match in Thurles, and then lost two close and well-played games to provincial champion Navan and Delvin (of Drogheda), putting us at 2-3 for the trip. Thousands of people came to our matches. It was the last time anyone besides a waiter asked me for my autograph. Capping our tour was a luncheon at the Irish White House – Áras an Uachtaráin – with President Éamon de Valera. Dev was 85 and losing his sight and hearing, but stood ramrod straight and could not have been more gracious. He showed us the Phoenix Park gardens after lunch (and asked our Mike Brennan to walk next to him, lest poor vision caused him to trip). “It was like meeting George Washington,” said my teammate Tom Weyer, now a retired insurance executive in Chicago. It wasn’t the first time Dev mingled with Notre Dame students. In 1919, after his escape from a British jail, he came to America to build support for an Irish republic. He stopped in South Bend, where he was carried to his hotel on the shoulders of students and other supporters. His visit may have played a role in the university adopting the nickname “Fighting Irish.” The most likely explanation of the nickname’s origin is that it came from a taunt against the immigrant Irish and other Catholic minorities who manned the Notre Dame football teams in the early 20th century. But students began to embrace the name as a symbol of the scrappy underdog, the striving immigrant. De Valera’s arrival – a real fighting Irishman – may have put it over the top. Since the statute of limitations has tolled, I sheepishly admit to one bit of mischief. Looking for a souvenir on our last day abroad, we borrowed the flag from atop the General Post Office, the shrine to the 1916 Easter Rising. A few weeks later, it appeared behind the bar at the old faculty club on Notre Dame Avenue. 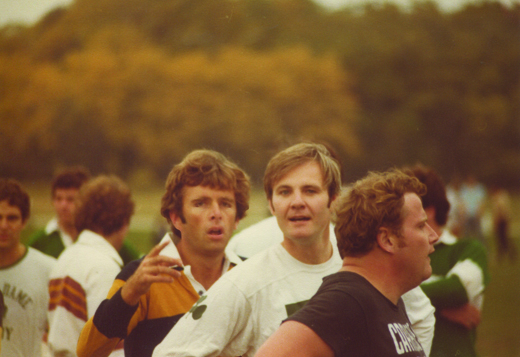 Tom Condon (third from right, striped shirt) and Tom Weyer (second from right), who were on Notre Dame’s 1968 rugby tour of Ireland, play an alumni pickup game, c. 1975. (Photo: Courtesy of the author). I later felt bad about this, because if we’d been caught we would have besmirched the university’s reputation and cashed in the good will we’d created on the trip. Plus, the people were so nice that if we’d asked the postmaster, he probably would have given it to us. We did, and we seniors soon graduated and scattered. For a few of us, our next trip out of the country was to the former Republic of South Vietnam, from which our stellar forward Bruce Heskett did not return. On a happier note, Tom Gibbs’s son Bill was a member of the Notre Dame football team that defeated Navy in Croke Park in Dublin in 1996, the first time the fabled Fighting Irish football squad played in Ireland. Father and son are lawyers in Chicago. Many of us played club rugby after college; Weyer took it to an extreme, playing regularly into his 50s and his last match at 67, making him, he modestly observes, the Minnie Minoso of rugby. Notre Dame always had ties to Ireland. About two-thirds of the university’s 17 presidents were of Irish birth or ancestry, including Rev. William Corby, C.S.C., who was the chaplain of the Irish Brigade in the Civil War. The connections to Ireland have multiplied since the 1968 adventure, especially with the creation 25 years ago of the Keough-Naughton Institute for Irish Studies. It is a major center for the study of Irish culture and includes the only Irish language program at an American university. Tom Condon, a longtime Connecticut journalist, is a retired columnist and chief editorial writer for the Hartford Courant. He now writes for the Connecticut Mirror at ctmirror.org. This article was originally published in the April / May 2018 issue of Irish America. Thanks for a great article. See you at reunion. Wondering why you do not mention the coach of Notre Dame Rugby team, Ken Featherstone. He played Rugby in U.K. and help start the Rugby team, he took the team to Ireland. Amazing piece, Tom! So poignant. Did Dev have any words of wisdom for the lads? Amazing piece! Poignant and beautiful. Did Dev have any words of wisdom for you lads? My parents loved going on that trip with “the boys”. Mom enjoyed the singing. Being Mike Brennan’s oldest son, this was an amazing read. Thank you for putting this together, what a wonderful story. Over the years I have had the chance to meet many of my Dad’s classmates and rugby teammates from ND. What a great group of people. Great piece. See you in Sunny Italy! Best article I’ve ever read ! Good job, Tom. I spoke with Eamon de Valera at the opening of a Gaelic school near Dublin circa 1956. I enjoyed your well-written, professional article. I remember going to a rugby game with my father at Croke Park, Dublin. Since everyone around us was cheering for one team, I started cheering for the other, considering them the underdog, and I garnered some strange looks. I’ve never figured out how rugby is played or scored, same case with cricket. But I loved hurling at Ring College and Gaelic football, and the lovely Irish language and script..
Well written and an excellent tribute to the Irish rugby club. 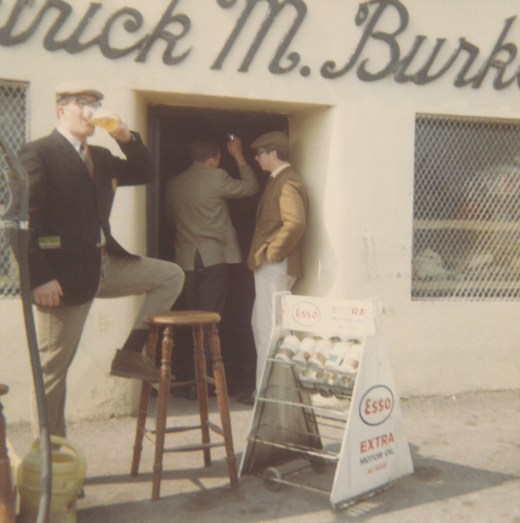 Thanks so much for writing the wonderful article about ND, rugby, and our 1968 trip. You brought back so many fantastic memories. I run into Tom Gibbs and Mike Brennan occasionally here in Chicago. I’ve been practicing law here for the last forty years.
. I remember you and Tom Figel well from being neighbors in Dillon Hall besides our rugby connection. The “68 lads paved the trail we took three years later in 1971.
trip, an adventure never to be forgotten. Hello Tom. I stumbled upon this article. 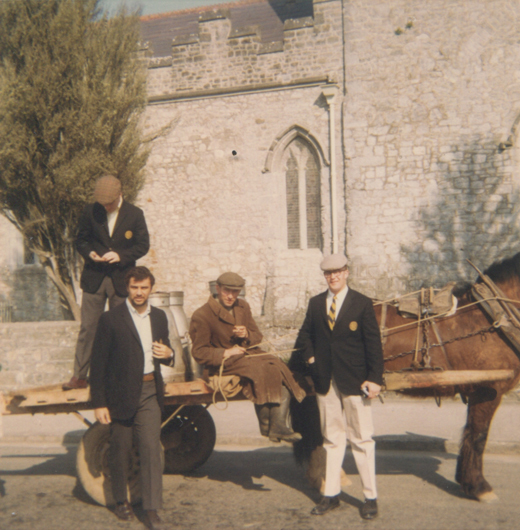 I know my father was instrumental in organizing the trip to Ireland and did his best to start the Rugby team. He was a Rugby player himself with a Rugby scholarship for school in Manchester U.K.. I doubt he was a “drawback” and left you teach yourselves, surely some knowledge of the game he had. It would have been nice to say a few kind words, just a few. Sounds like you were a great Rugby player, I hope you enjoy your reunion.